Another trip to The Shores and another murder. This time washed up actor Lance Lord is found on the beach with an axe wound to the head. With a hurricane barrelling down the coast, it's a race for the police to gather evidence before it all gets washed away. Jane Jamieson heads this case; it's a chance to get herself to Toronto where the real crime happens. The odds are against her as she races across the causeway to the crime scene. On the scene is Hy McAllister. She literally fell over the body while jogging. Her camera may hold the only clues to a murder. The usual suspects aren't so usual: a feuding neighbour (now missing), a fitness guru and his companion, and two ex-wives with wildly differing personalities. Jamieson tries to go by the book but nothing at The Shores ever goes by the book. She finds herself conducting an investigation from a community hall during a fundraising ceilidh. Hy is doing some investigating of her own. Some not quite police approved investigating. Who will catch a killer first? 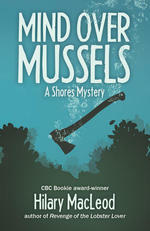 Despite the title, mussels play a minor role in Mind Over Mussels, unlike the first book Revenge of the Lobster Lover. In this second instalment, I learned more about the characters. I'm loving how Jane Jamieson sticks with her 'just the facts ma'am' approach in such a tightly knit community. It looks like a losing battle though. And what is the deal with Hy and Ian? Are they going to admit they like each other or what? Hy has seeeecrets and I wonder what she's keeping from us. To read Mind Over Mussels, the reader must keep an open mind (punny!) and a loose grip on reality. The victim is found in Jimi Hendrix gear, for goodness sake, and whole Mind Over Muscles theory is kinda out there. So yeah, silliness! I sometimes thought too hard about that theory and it took me out of the story. Mind Over Mussels is a good read if you're looking for something a bit different. Although I enjoyed Revenge of the Lobster Lover more, this is a good second and I look forward to seeing where the series goes next. Thanks to Acorn Press for the review copy. Sometimes fun is just the thing! I've never heard of this author, so thanks for introducing me! I can suspend disbelief if the story has captivated me enough. This sounds like a good series. Never heard of the author or the title. I had to look up the word "ceilidh". But it's good, because I learned a new word for social gathering. :-) This sounds like a quirky book, I like quirky when I'm in the mood for it. Thanks for sharing it. I have the first book in this series out from the library right now, but I am not sure when I will get to it. It sounds fun! Thanks for the review! I hope readers will take a taste of "Mussels" and "Lobster" too! Kathy- Give it a try! Hilary- Thanks for dropping by!